In 2012, three leaders of Barotseland were imprisoned by the Zambian State for exercising their right to self-determination. Since his imprisonment, leader Sylevester Kalima has battled continuous illness from poor detention conditions and was even hospitalised for a blood transfusion earlier this week. In light of this hospitalisation, the Barotse have called for support from their community to better attend to the welfare of the imprisoned leaders. They have also promised to hold the Zambian government responsible for any mistreatment sustained by the leaders. According to a source from within the Barotseland independence movement, Linyungandambo, Sylvester Kalima was admitted to Kasama general hospital on Friday, 13th October, 2017, and has had to undergo a blood transfusion yesterday, Monday, 16th October, 2017 due to lack of blood. “Yes. Honorable Kalima has been admitted to Kasama general hospital since Friday, and we ask for prayers on his behalf and that of his family in this moment of great need,” confirmed the source close to the family. 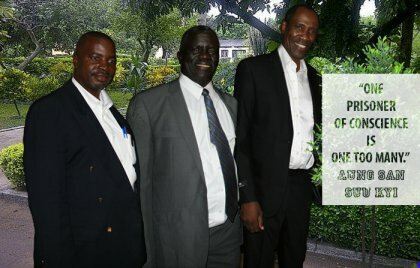 The source further appealed to all regiments and supporters across Barotseland to scale up their logistical and financial support through the existing and set up channels to compliment family efforts in the health care and general welfare of not only Honourable Kalima, but also Barotseland Administrator General, Afumba Mombotwa and Likando Pelekelo who are serving similar sentences in Luwingu and Mansa respectively. Kalima has constantly experienced ill health ever since his first hospitalization over suspected food poisoning last year at Mwembeshi state prison where the Barotse trio was imprisoned before they were suddenly and dramatically transferred to separate state prisons located in remote north regions of Zambia, a move widely seen to be aimed at isolating the three Barotseland leaders from the support of family and friends back home. And the Linyungandambo leadership has warned that the Zambian government will be blamed for any harm that would occur to any of the Barotse leaders in prison, calling on them to do right in ensuring that Barotse people are treated justly and humanely. “After all, Zambia, which claims to be a Christian country, is the one that is in violation of Barotse’s cultural, economic and political rights among others,” warned the Linyungandambo source, adding that the Barotse community would not sit quietly by but would ‘react seriously’ should harm befall any of their leaders in prison. “We call on the Zambian leadership to use their day of national fasting and prayers for peace, forgiveness and reconciliation to look into the injustice of the Barotse people they have kept in their inhuman prisons for no justifiable reasons,” concluded the Linyungandambo leader.